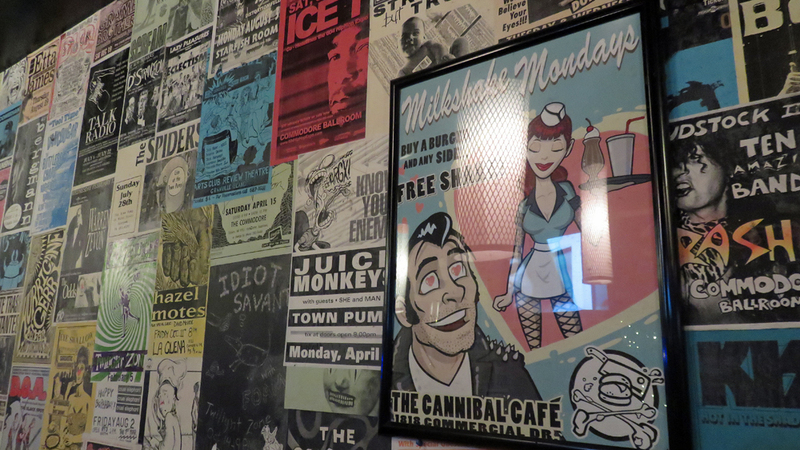 The Cannibal Cafe is Where Locals Go for Burgers in Vancouver – Why Am I Not There? For the cynical traveler, Vancouver can just be an extension of Pacific Northwest stalwarts Seattle and Portland. Case in point, the funky and punky eateries that dot the trendy East Vancouver area of the city. Located among like-minded business and near the community college, the burger-minded diner The Cannibal Cafe has walls lined with every rock band you listened to back in the day but forgot about because you are old and washed. As I do with any city, I determined the best burger joint and since this popped up often and had the punk rock angle, this was my place. Then, it was within walking distance of some breweries and divey-drinking holes. The burger was big, and intense I went with the Bacon Bad — Bacon & cheddar stuffed patty, applewood smoked bacon, Canadian cheddar, maple bacon bourbon jam, roasted garlic mayo, L.O.T.P. For reals, Canadians love their maple products. And because I overeat while I’m traveling — poutine mac and cheese, because it’s POUTINE MAC AND CHEESE. While you inhale your burger, you can read the walls.